I'm not sure if my family is the only unlucky ones but we've certainly had our fair share of colds, strep throat, viruses, sinus infections and other weird, unexplained health things this winter. Fortunately for me, I've managed to mostly escape it with nothing more than a runny nose here and there. Well, maybe a few other things but I'll classify them into the TMI category and save you the details. Currently I'm home for the second time this week with a sick kiddo. The poor thing is struggling with weird symptoms that put her into extreme pain which then brings on massive amount of tears. We had to do blood work and x-rays today and now we wait. Waiting for the Dr. to call is one of the hardest things EVER! 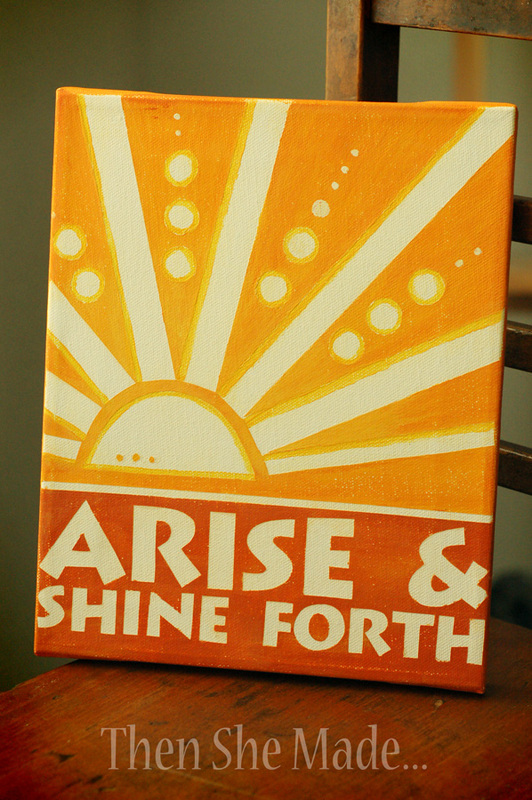 The good part of the waiting is that while I've been trying to pass time I have finished up a few word art projects. Wanna see??? I made this one for my life-long friend, Judy. 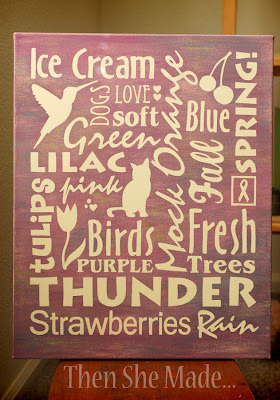 She asked me to make her a word art to cover her electrical panel that is by her back door. She's been very, very, very patient with me while I made this. I'd work on it, then set it aside. I even had to restart it once as I realized the words I printed out were too small and wouldn't work with the paint part. Needless to say, it's finally done and she can now cover that electrical panel and think of me and all the things she loves, like thunder, trees, cats, and ice cream ever time she heads outside. My daughter and I also finished up these. 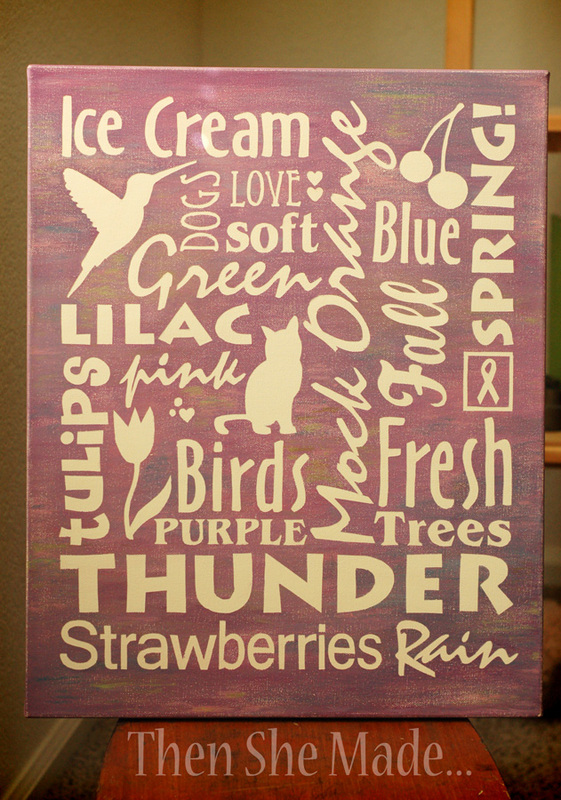 Miss M, my 14 yr old daughter, made the one above and was going to make these word art panels and sell them as a fundraiser for a summer youth program that she wants to attend. She ditched the idea though because she realized babysitting was the easier way to stock pile her earnings. Also, using the same theme, I made this one. I wanted one to keep in our kitchen. 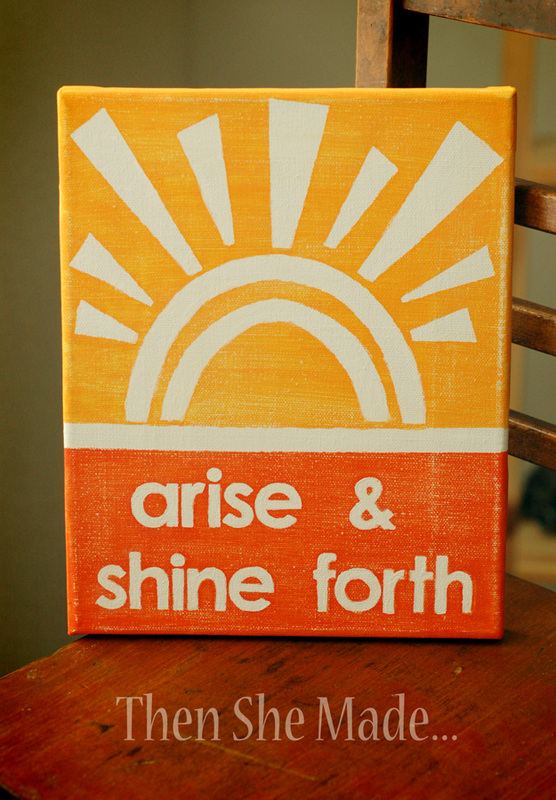 The statement, Arise and Shine Forth is a special statement for the youth at my church and we are focusing on it as a family too. All my word art projects are made using contact paper, canvases, and paint. I've got another big project in the works. It's a time consuming one though but I'm digging it so far. Love both of the projects! Praying for your kiddo! I just have to keep looking at it! I particularly love that Thunder is in the biggest letters of all. Love all 3 projects! Thanks for sharing.I have a couple canvas's that I need to do but I keep putting them off. Hope your kiddo feels better soon.